Hailing from Copenhagen, Denmark the Norwegian born Gunhild Jarwson Tekle – a.k.a. 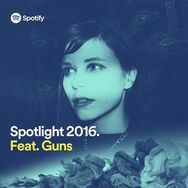 Guns is a rising star on the Scandinavian indie pop scene. Debut single ‘Ricochet’ landed in June 2015 and was greeted with applause. Larger blogs like Blah Blah Blah Science quickly became aware of the song and this interesting new artist. Guns’ dreamy indie pop universe caught attention and in the June edition of NME Magazine there was a great review of the debut- single; “... ‘Ricochet’ is a woozy, melodic and near enough flawless way to introduce herself ... feels every bit as life affirming and perfect as Beach House”. Too Many Blogs: Guns style of dream-pop has gained comparison to the likes of Tei Shi, The Knife, Kate Bush and Solange. I get a Beach House vibe from it though and the track is worth listening to just for the killer chorus. IHEARTMOOSIQ For a dreamy yet crisp pop ballad, you can’t miss this debut, from a new 24 year old Norwegian act named guns. Guns’ first offering is a fittingly named tune named Ricochet, and while I’m not too clear on what’s going on with all the firearm references, I am very much enchanted by the beautiful song. Guns is heavily influenced by acts like Kate Bush, Blood Orange, and ABBA, and there’s no missing bits and pieces of these acts all melded together in her meandering, swirly song, which carries an off kilter undertone that has a slightly ominous tincture. It’s a dazzling, imaginative song that leaves me endlessly curious to hear more from the Norwegian songstress.